Contrary to what you have thought, felt and known about yourself, you are indeed more than enough. This world we live in makes it easy for us to grow up with unhealthy self-esteem. Our society can cause unhelpful and negative refute to how we feel about ourself, often in very destructive ways. We might spend our lifetime trying very hard to undo the damage that had been done earlier, sometimes to no avail. Our Ego mind offers up no help at all, with it’s constant put downs, excessive criticism and cynical comments, it can be very convincing of the anything and everything negative. The Ego has its way of wiping out all that is positive in one clean sweep, a single word that comes to our mind can change the face of how we feel about who we are as a person, in less than a breath. Everything we have been conditioned to believe and that which has an opposing nature, is in fact a lie or has been falsely spoken. Pessimism might have been the first word you spoke when you were a baby, if you could have pronounced it. A great deal of what we learn as a child (depending on the circumstances) is not of an optimistic nature. The patterns that follow us, to some degree involve rejection and this is where it starts. The programming of our mind takes years to perfect, and with the help of our choice in people, places and things, the job gets well done, to say the least. Never or at best not often along the way, might we ever say to ourself, ‘I am more than enough’! ‘I am all I need’, what if this had been our mantra when we were of an age before we began to deny ourself, perhaps a lot of our life would have turned out very differently. Without our experiences, good or not so good, you might say, you wouldn’t be who you are today. This is true, without a doubt, life as we know is about trials and tests, challenges, big and heavy walls to chip away at. Even though you may never have believed in the past that you are more than enough, the time has come for you to begin to believe in it now. Being enough is knowing that you are sufficient, adequate, as much as necessary and a more than ample supply of who you are, what you give, how you love and how you live. The presents of your energy on this earth is as much a blessing as anyone else’s. 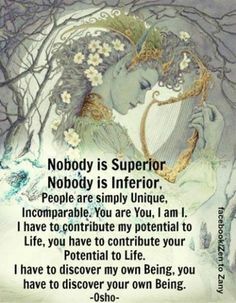 Empower yourself with self-love and self-acceptance, and be a witness to your very own healthy and happy self-esteem, you deserve to feel worthy and more than anything else, you merit to feel more than enough.